You've probably seen some of those stick-on phone pouches at your local department store. 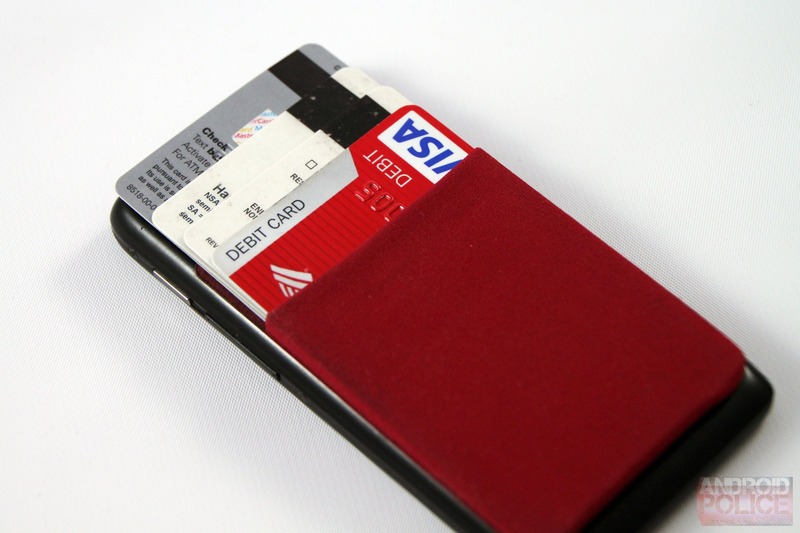 It's a very simple idea: a little nylon pocket with glue on one side, intended to stick to your smartphone and carry credit/ID cards. I've tried several in a never-ending quest to banish my wallet, but they were all cheap, with poor glue and easily-torn material. Then I chanced $12.99 on the Sinji Pouch. This little guy has changed my daily routine for the better. 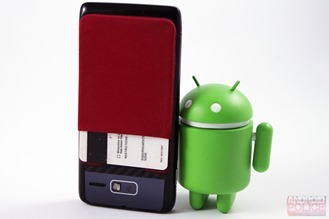 It hangs out on the back of my DROID RAZR M, content to hold two credit cards, my driver's license, and another ID, gripping them in a firm yet soft embrace like the Brawny Paper Towels guy. There's just enough stretch in the fabric that the cards are held in place via friction, but not so much that it's hard to bring any one of them out. 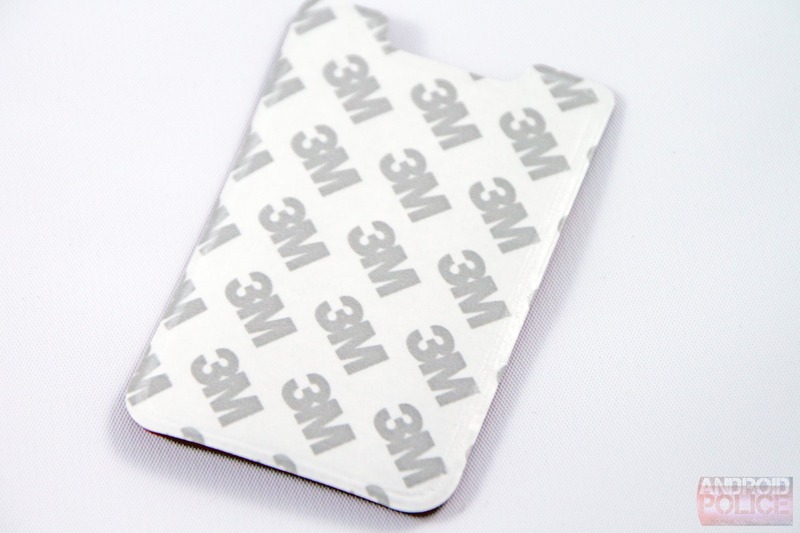 The glue comes from 3M (which I haven't seen on any competing products) and is showing no signs of relenting after a month of travel in my pocket and on my car dashboard. The felt on the back portion of the pocket helps grip the cards, so even with only my driver's license inserted, it's not in any danger of falling out. 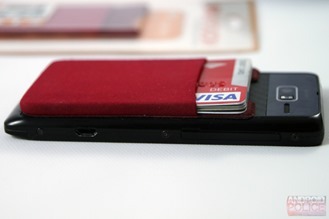 The Sinji Pouch holds my four cards comfortably, but I doubt it could hold more than five without gripping too tightly to easily remove the top or bottom card. Those who need more than that should probably look elsewhere. If you've got an essential daily ID that's bigger than a US driver's license, like my CPR certification card, it's a much tighter fit. You can generally add a couple of folded cash bills without issue, but anything more will cause too much stretching (and an unsightly bump). Also note that the pouch is sized for the iPhone 5: it fits pretty well on my RAZR M, but anything without a flat, smooth surface at least as big as the sticker itself may create retention issues. Phones with an exaggerated curve, like the Galaxy Nexus or HTC One, may also have trouble. 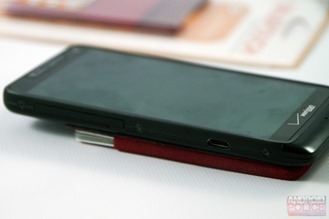 Naturally, sticking four cards to the back of your phone is going to make it noticeably thicker. It also means that I have to remove the cards to get the phone into my car navigation mount. You could alleviate this with a universal mount, or by sticking the Sinji Pouch to one of the thinner cases available and removing it when necessary, but of course that would make the whole thing even thicker. 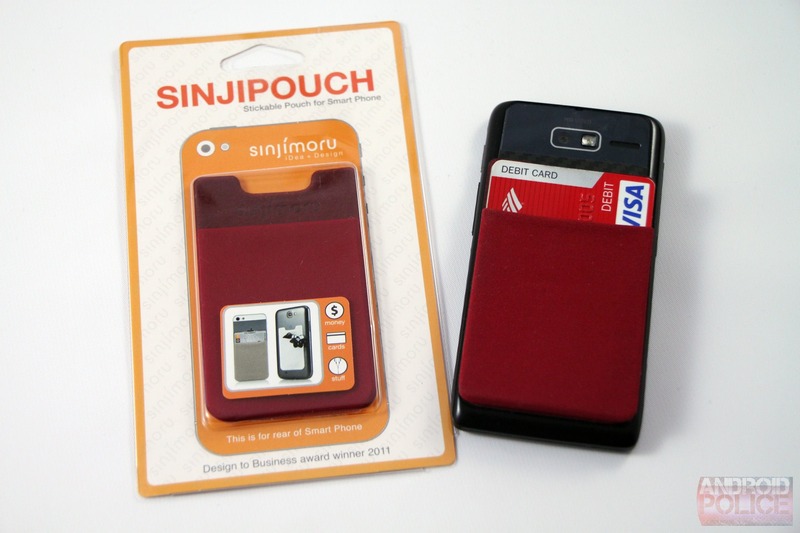 The Sinji Pouch is not for everyone, but it's probably the best version of the sticky-wallet idea. 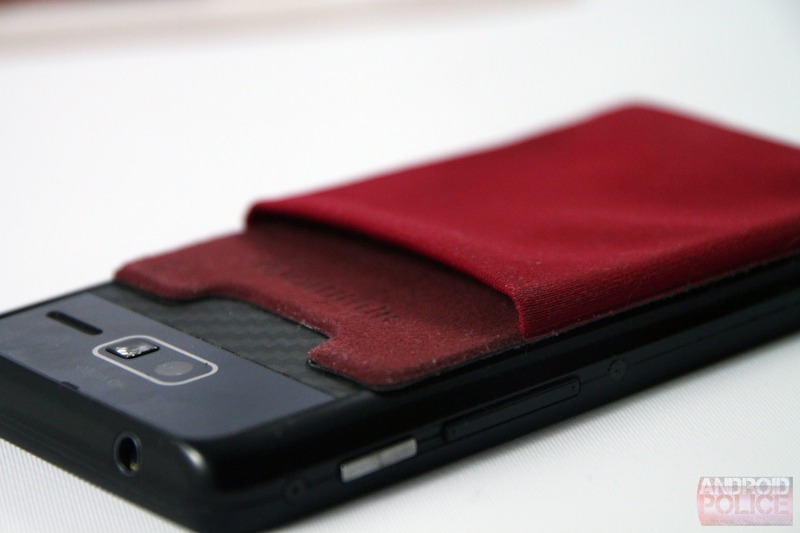 What I'd really like is a full leather wallet case made for my phone like this one, but since accessory makers continuing to shun the less-popular Android devices in favor of iPhones and various Galaxies, this is a decent and economical solution.